For people who eschew all animal and dairy products, our vegan gifts are thoughtful and delicious. 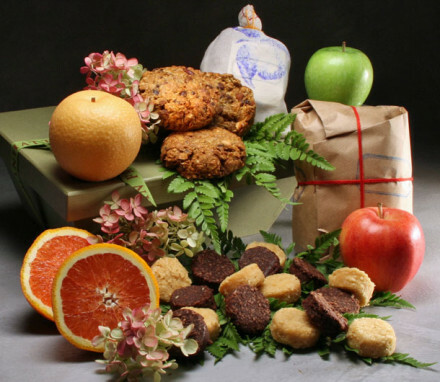 We've carefully selected vegan baked goods and treats that are rich in protein and nourishment. More and more people are choosing to eat a healthy vegan diet, which eschews all animal and dairy products including butter, eggs and cheese as well as all animal meat and fish. If you think that this means vegan food must be bland and ordinary, you are wrong! We offer a line of vegan gift baskets that feature delicious vegan baked goods, chocolate and sweet treats, artisanal vegan cheeses, vegan breakfast gifts, a vegan pantry collection, and several vegan snack gifts perfect for parties that are far from boring. Our local Sweet Leaf Café and bakery in Long Island City, makes a vegan cookie just for us that we call “Choc-a-Block”: an oversized cookie with peanut butter, raw unsweetened organic raw coconut flakes, banana, and semi-sweet dark chocolate-chip (sweetened with a bit of organic raw sugar) all combined into a medley that is rich and moist and bursting with complimentary flavors. 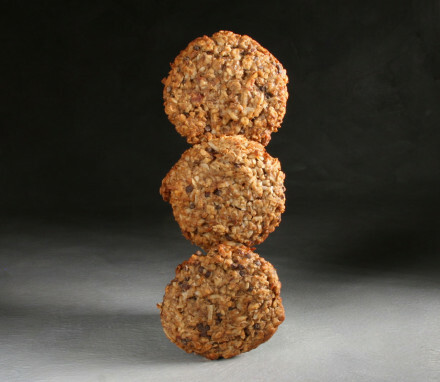 We also offer Emmy’s yummy vegan and organic coconut cookies in vanilla and dark chocolate flavors; sweet and crunchy meringue chips – an unusual organic vegan confection made out of aquafaba (a really cool stock made out of the water left from cooking chickpeas!!) by the MeringueShop, and; “Rawclates”, in Café au Lait, Matcha, and Earl Grey flavors made by Life by Chocolate that are extraordinarily delicious chocolate bars that are gluten-free, dairy free, soy free, fair trade and Kosher too! 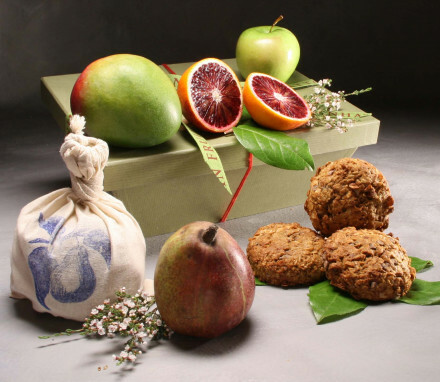 Our vegan cookies, chocolates and sweets can be paired with fresh pick of the season fruit, so you can feel confident these are some of the best Vegan gifts for someone who is both healthy conscious and has a sweet tooth. People following a vegan diet often have to pay attention to consume enough protein every day for good nutrition, so we designed our vegan food hampers with protein in mind. We discovered a small local vegan cheese maker that makes the best vegan cheese we have ever tasted! Don’t for a minute think that these delicate selections are anything like the vegan imitation cheeses that you can find in the grocery store. Our vegan cheese hamper features a selection of three exquisite vegan cheeses in an insulated pouch, vegan crackers, olives, fresh fruit and a cheese knife. Perfect to serve as hors d’oeuvres for vegan and non-vegan guests alike. For breakfasts at home, our vegan breakfast gift boxes feature either organic ancient grain mix oatmeal from Farm to Table will deliver a protein and fiber packed start to the day, or vegan bagels with vegan scallion cream cheese, capers and organic blood orange juice! In keeping with the healthful nature of a vegan diet, we searched for snacks in our vegan food gift boxes that were nutritious and tasty alternatives to the ubiquitous tortilla chips and crispy sugary cookies. Vegan-certified Flamous Original Falafel Chips are naturally low in cholesterol and saturated fats, and made with whole beans. 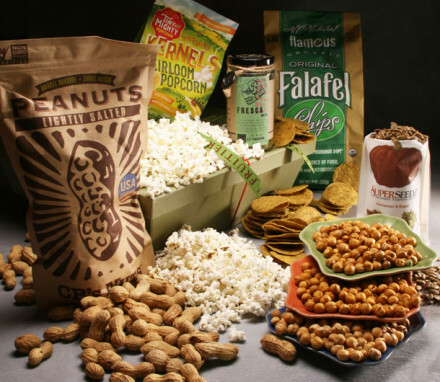 Chick Pea Snacks by Pulse and Superseedz Pumpkin Seed Snacks all in a variety of flavors also provide protein as well as satisfying crunch. Our Strictly Vegan collection introduces a variety of new gifts for vegans. Shop Manhattan Fruitier today for vegan gift baskets delivered nationwide! Or, if you’re looking for a gluten free option, explore our gourmet gluten free baskets as well. *Although fruit is often used for special dietary restrictions, our vegan gift boxes are not designed to meet individual health needs or to treat, cure or prevent any disease or condition. Please make sure to consult a medical professional regarding any questions about your specific dietary needs and restrictions. We are happy to answer any questions about the ingredients!